One question we get asked a lot is about building an IR Illuminator. An IR Illuminator allows a camera to see in total darkness. This can be useful for security applications or maybe you want to watch the night activities of the local wildlife. 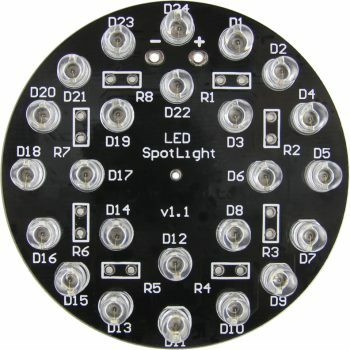 The IR Illuminator is based around our LED SpotLight PCB which holds a total of 24 LEDs on a circular PCB. The board is equipped with 24 special IR LEDs which do all of the work, along with 8 current limiting resistors. This project is very simple to build up, and can be fully assembled by a novice builder in about 30 minutes. When you build your IR Illuminator, you need to decide what frequency of LEDs to install on the board. There are two common frequencies available, one at 940nm and the other at 850nm. The most commonly used frequency with black and white CCD cameras is the 940nm model. 850nm LEDs produce a very slight red glow when operating, which is visible to the human eye. 940nm models produce no visible light to the eye. We carry both frequencies of the IR LEDs, see our LED page and look for model IC601-02 for 850nm and IC601-03 for the 940nm models. Your first step is to identify and collect the parts necessary to build the system. 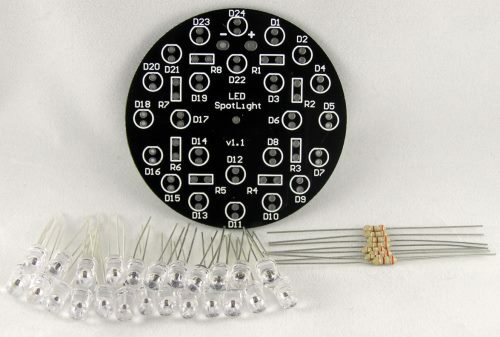 We will be using our LED SpotLight PCB, along with 24 of our Ultra-Bright IR LEDs and 8 resistors. Shown to the right are all the parts that are required. Once fully assembled, power to the circuit is needed and we have setup this one to run on 12v DC at about 160mA (0.160A). To run at other voltages, you must select the correct value of dropping resistor (of which there are eight) - we have even simplified this process with our online Dropping Resistor Calculator. For this build, we are using 390ohm one-quarter watt resistors. Once you have all the parts, the first step is to become familiar with the PCB. It is setup with 24 LEDs in total, 18 around the outside and another 8 on the inside (all the LEDs are labeled D1 to D24). The resistors will go on the board at position R1 to R8 which are located between the inner and outer rows of LEDs. Finally, power is applied to the board just below D24 where you will see the Positive and Negative solder pads. In the very center of the PCB is a single hole. This hole can be enlarged to be used for mounting or even further to fit around a camera lens. 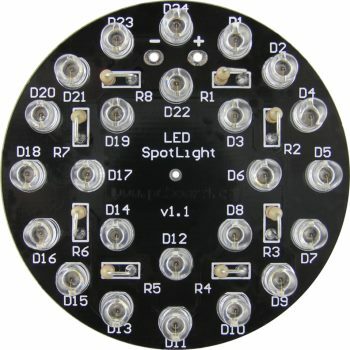 The simplest way to begin the install is to insert and solder into the board the inner row of LEDs. These are located at D3, D6, D8, D12, D14, D17, D19 and D22. Keep in mind that LEDs are polarity sensitive, so ensure that you line up the flat on the LED with the flat on the solder mask on the board. After you have soldered in the first 8 LEDs, trim the leads. 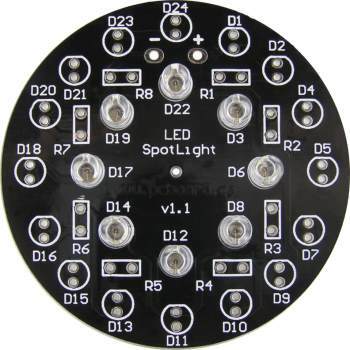 Now you should install and solder in the LEDs at D1, D2, D4, D5, D7, D9, D10, D11, D13, D15, D16, D18, D20, D21, D23 and D23. When installing the LEDs, try to keep them flat against the board. The last step is for the installation of the 8 current limiting resistors which go at positions R1 to R8. The resistors will stand on their ends for this project. Unlike the LEDs, the resistors are not polarity sensitive and can be installed any way you want. Once the board is fully assembled, you can now apply power leads to the power input terminals. We have seen these units mounted in many different types of housing, including PCV plumbing end caps. When you power up your system, you may notice a slight glow to the LEDs. This is common on 850nm models where you will see a slight red glow to them. The 940nm models do not have any glow that is visible to the human eye. Good luck with your build and you are sure to receive many years of service from your IR Illuminator display.